If Christ was in fact God, he knew all the future. Before Him like a panorama moved the history yet to be. He knew how his words would be interpreted. He knew what crimes, what horrors, what infamies, would be committed in his name. Is it necessary that Heaven should borrow its light from the glare of Hell? Infinite punishment is infinite cruelty, endless injustice, immortal meanness. To worship an eternal gaoler hardens, debases, and pollutes even the vilest soul. While there is one sad and breaking heart in the universe, no good being can be perfectly happy. I did say that to deny the existence of evil spirits, or to deny the existence of the devil, is to deny the truth of the New Testament; and that to deny the existence of these imps of darkness is to contradict the words of Jesus Christ. I leave pansies, the symbolic flower of freethought, in memory of the Great Agnostic, Robert Ingersoll, who stood for equality, education, progress, free ideas and free lives, against the superstition and bigotry of religious dogma. We need men like him today more than ever. His writing still inspires us and challenges the “better angels” of our nature, when people open their hearts and minds to his simple, honest humanity. Thank goodness he was here. I am going to do that which the dead oft promised he would do for me. The loved and loving brother, husband, father, friend, died where manhood’s morning almost touches noon, and while the shadows still were falling toward the west. Love is the only bow on Life’s dark cloud. It is the morning and the evening star. It shines upon the babe, and sheds its radiance on the quiet tomb. It is the mother of art, inspirer of poet, patriot and philosopher. MY FRIENDS: Again we, in the mystery of Life, are brought face to face with the mystery of Death. A great man, a great American, the most eminent citizen of this Republic, lies dead before us, and we have met to pay a tribute to his greatness and his worth. I neither assert nor deny the immortality of the soul; I simply admit that I do not know. Upon that subject I am absolutely without evidence. This is the only world that I was ever in. There may be spirits, but I have never met them, and do not know that I would recognize a spirit. I can form no conception of what is called spiritual life. It may be that I am deficient in imagination, and that ministers have no difficulty in conceiving of angels and disembodied souls. The saints have poisoned life with piety. They have soured the mother’s milk. They have insisted that joy is crime—that beauty is a bait with which the Devil captures the souls of men—that laughter leads to sin—that pleasure, in its every form, degrades, and that love itself is but the loathsome serpent of unclean desire. They have tried to compel men to love shadows rather than women—phantoms rather than people. Art is not a sermon, and the artist is not a preacher. Art accomplishes by indirection. The beautiful refines. The perfect in art suggests the perfect in conduct. Nature has furnished every human being with a light more or less brilliant, more or less powerful. That light is Reason; and he who blows that light out, is in utter darkness. It has been the business of the church for centuries to extinguish the lamp of the mind. Whether the Bible is true or false, is of no consequence in comparison with the mental freedom of the race. Salvation through slavery is worthless. Salvation from slavery is inestimable. The civilization of this century is not the child of faith, but of unbelief – the result of Freethought. All I insist is, if there is another life, the basest soul that finds its way to that dark or radiant shore will have the everlasting chance of doing right. Nothing but the most cruel ignorance, the most heartless superstition, the most ignorant theology, ever imagined that the few days of human life spent here, surrounded by mists and clouds of darkness, blown over life’s sea by storms and tempests of passion, fixed for all eternity the condition of the human race. If this doctrine be true this life is but a net, in which Jehovah catches souls for hell. The idea of immortality, that like a sea has ebbed and flowed in the human heart, with its countless waves of hope and fear, beating against the shores and rocks of time and fate, was not born of any book, nor of any creed, nor of any religion. It was born of human affection, and it will continue to ebb and flow beneath the mists and clouds of doubt and darkness as long as love kisses the lips of death. It is the rainbow – Hope shining upon the tears of grief. Essence of Ingersoll’s Case Against Religion and Former Supreme Court Justice Black's Answer in This Great Written Debate Editor's Note: Since Ingersoll wrote no books nor any comprehensive single statement of his case against Christianity, the next best thing might be found in his written debates — the best kind since there is no room for acting; or excuse for careless words or forgotten points. He had several of these with leading figures of the day, including former British Prime Minister William E. Gladstone; Cardinal Manning, Archbishop of Westminster; Rev Dr Henry M. Field; and many others. Direct links to all of these can be found in the Indexes here. One great objection to the Old Testament is the cruelty said to have been commanded by God. All these cruelties ceased with death. The vengeance of Jehovah stopped at the tomb. He never threatened to punish the dead; and there is not one word, from the first mistake in Genesis to the last curse of Malachi, containing the slightest intimation that God will take his revenge in another world. It was reserved for the New Testament to make known the doctrine of eternal pain. Mark Twain, was also a speaker at this great event. He said of Ingersoll’s speech: the supremest combination of words that was ever put together since the world began …Bob Ingersoll’s music will sing through my memory always as the divinest that ever enchanted my ears. This Infinite LIE. 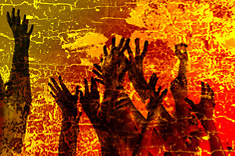 No human being has imagination enough to conceive of this infinite horror [hell – eternal pain] All that the human race has suffered in war and want, in pestilence and famine, in fire and flood – all the pangs and pains of every disease and every death – all of this is nothing compared with the agonies to be endured by one lost soul. *These letters were published in the New York World, 1894. I DO not know whether self-killing is on the increase or not. If it is, then there must be, on the average, more trouble, more sorrow, more failure, and, consequently, more people are driven to despair. In civilized life there is a great struggle, great competition, and many fail. To fail in a great city is like being wrecked at sea. In the country a man has friends; he can get a little credit, a little help, but in the city it is different. I send you some of the most wonderful whiskey that ever drove the skeleton from a feast or painted landscapes in the brain of man. It is the mingled souls of wheat and corn. According to one of these gospels, and according to the prevalent Christian belief, the Christian religion rests upon the doctrine of the atonement. If this doctrine is without foundation, the fabric falls; and it is without foundation, for it is repugnant to justice and mercy. Is it necessary to understand Hebrew in order to know that cruelty is not a virtue, that murder is inconsistent with infinite goodness, and that eternal punishment can be inflicted upon man only by an eternal fiend? Is it really essential to conjugate the Greek verbs before you can make up your mind as to the probability of dead people getting out of their graves? Must one be versed in Latin before he is entitled to express his opinion as to the genuineness of a pretended revelation from God? Common sense belongs exclusively to no tongue. Logic is not confined to, nor has it been buried with, the dead languages. Washington, D. C., January 8, 1882. A DC detective friend asked Ingersoll to speak at his child’s grave. MY FRIENDS: I know how vain it is to gild a grief with words, and yet I wish to take from every grave its fear. Here in this world, where life and death are equal kings, all should be brave enough to meet what all the dead have met. I would like to see a miracle like that performed in North Carolina. Two men were disputing about the relative merits of the salve they had for sale. One of the men, in order to demonstrate that his salve was better than any other, cut off a dog’s tail and applied a cast away, put a little salve at the end of that, and a new dog grew out, and the last heard of those parties they were quarrelling as to who owned the second dog. Something like that is what I call a miracle. Science denies the truth of myth and miracle, denies that human testimony can substantiate the miraculous, denies the existence of the supernatural. Science asserts the absolute, the unvarying uniformity of nature. Science insists that the present is the child of all the past, – that no power can change the past, and that nature is forever the same. 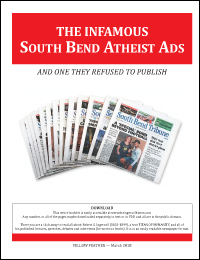 See all of the Infamous South Bend Atheist Ads and more in one downloadable PDF booklet. Mark Twain and General Lew Wallace remember Ingersoll. For the first time in Christian history and Inspired by Ingersoll, I planned a series of 14 pages of advertisements – many full pages –to be published in the South Bend Tribune newspaper with a claimed circulation of 300,000. They published 9, refused 1, and summarily cancelled 4 without explanation. See all of these by clicking on the tab above. THE INFAMOUS SOUTH BEND ATHEIST ADS. After eighty four years of life, I can think of nothing better I can do than to make it easier for you to learn about this great soul and to read some of the words which – when spoken by him – mesmerized America for thirty years – even those who disagreed with him. Be sure to look at the About Ingersoll page – you will wonder that such a man existed. You will have to remind yourself that he died in 1899, so pertinent is what he had to say to today. But also allow that what he spoke of "within the past 50 years" that was some 160 years ago for us. His recent past was very different from ours. This Home Page takes you directly to the full text of 31 pieces selected as a sample from 432 available to you here. 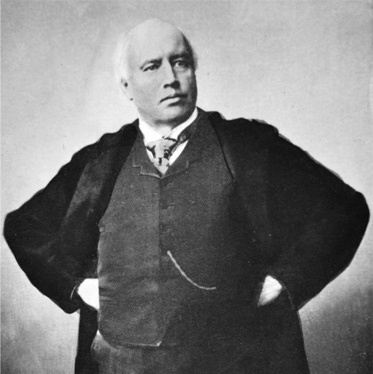 Ingersoll wrote no books; all are articles, book reviews, newspaper interviews, lectures, debates and such. Some of the most beautiful and profound things he had to say are disguised in subjects like a Tribute to; An Interview with; or in a Book Review. You will have to discover these because an Index can only go so far. There are three indexes here to help you and two link you directly to article you select in the 12 volumes. Ingersoll addressed all of these questions on many occasions and it is astonishing to read how he could do so with entirely new and brilliant words. I welcome comments and criticisms as long as I'm here and able. Write me at fellowfeather@gmail.com – as in: fellow feather on the sea of fate. This frightful declaration, “He that believeth and is baptized shall be saved, but he that believeth not shall be damned,” has filled the world with agony and crime. Every letter of this passage has been sword and fagot; every word has been dungeon and chain. Question. I see that the clergy are still making all kinds of charges against you and your doctrines. Answer. Yes. Some of the charges are true and some of them are not. I suppose that they intend to get in the vicinity of veracity, and are probably stating my belief as it is honestly misunderstood by them. I admit that I have said and that I still think that Christianity is a blunder. Millions assert that the philosophy of Christ is perfect – that he was the wisest that ever uttered speech. I cannot believe that an infinitely good God would make anybody a wanderer. Neither can I believe that he would keep millions of people without country and without home, and allow them to be persecuted for thousands of years, simply that they might be used as witnesses. Nothing could be more absurdly cruet than this. The real Bible is not the work of inspired men, or prophets, or apostles, or evangelists, or of Christs. Every man who finds a fact, adds, as it were, a word to this great book. It is not attested by prophecy, by miracles, or signs. It makes no appeal to faith, to ignorance, to credulity or fear.